Hi everyone – I hope everyone had a great Christmas with their families, and are enjoying the New Year. I know that a number of our older Junior families have already been back playing cricket – whether that be Representative Cricket, or our Juniors playing in our Senior teams!! Please support our sponsors, and say that you are from Nunawading Cricket Club!! As you can see, our U18 team is starting back a week earlier than most other teams. Our boys are playing at home, so it would be great to have heaps of support there for them. Our younger Juniors I know would get a great insight into watching our U18 boys play (a number of our young men are only 15-16 years old)! Our younger Juniors rarely get the opportunity to watch our older juniors play, as they are playing themselves, so this is an opportunity that does not come around often. It was only about 5 years ago that our U18 boys were playing U10 -U12 cricket!! Please come down and support the boys!! 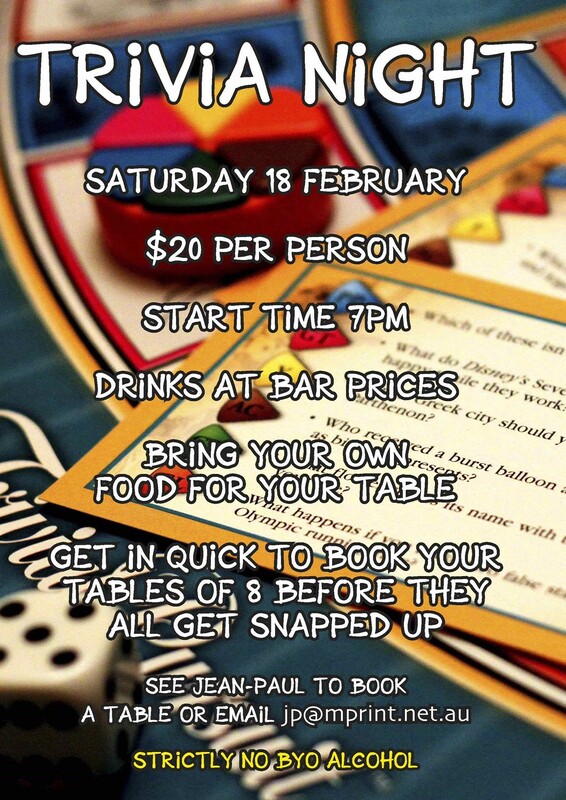 The Clubs annual Trivia Night will be held on Saturday 18 February. This is always a great night, with lots of fun and many prizes. Jean Paul Lefebure is organising the night, so it is guaranteed to be a fantastic event!! We generally get a good turnout of Junior Families, so if you are interested, either write your name up on the sheets in the Club Room, or contact Jean-Paul at jp. Flyer attached! All Nunawading Cricket Club families are now entitled to 10% off the price of a sit down meal and drinks at the Groove Train in East Burwood. Simply show your Nunawading CC membership card, and your discount will apply!! This weeks #beinvolved member(s) of the week is the Richardson family. The Richardson’s have been at Nunawading CC ever since our Junior Program restarted again some 8-9 years ago. For many years, Lynda has done an amazing job as Team Manager and supporting the coach. Lynda, generally always scores, and this year has been instrumental in ensuring our Nunawading / Yarraleen U18 team has been successful. Mark is always at the club, helping set up games, watching, and just last week made his Nunawading senior debut in 38 degree temperature. Josh has obviously played at Nunawading in the juniors all his cricket career. Has captained the team for many seasons, and is regularly helping out in many ways – showing great leadership. Josh now also plays senior cricket for Nunawading, and is currently playing Representative Cricket. The Richardson are a great example of a Nuna family, who contribute in many ways on and off the field. Thank you! !